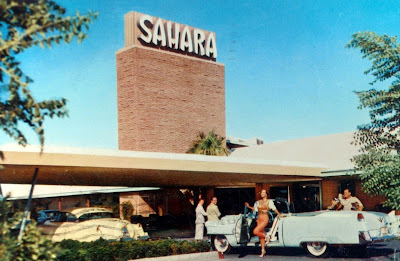 For the last 58 years you've been able to head to Las Vegas and check in at The Sahara Hotel & Casino, but now you can't. The last guests are checking out yesterday and soon the legendary hotel will be imploded. The hotel once showcased some of the biggest stars on the Strip, including comedians Don Rickles and Johnny Carson and singers Dean Martin and Tina Turner. The Jerry Lewis Muscular Dystrophy Telethon originated from the Sahara for 20 years. Unfortunately, about 1,050 jobs will be lost in the process and further bookings to the hotel are being routed to it's partner hotel, Circus Circus. With hard times hitting Vegas even harder than most US cities, the prospect of finding other jobs is not good. So here's to an end of a iconic Vegas hotel that's been part of Sin City since 1952.